Blending boards are very useful tools midway in size between hand cards and a drum carder. They can be used in myriad ways - to paint beautiful little art batts for spinning or felting, to test a blend of different fibers before committing to a larger quantity, to blend small amounts of precious fibers so that none gets lost in commercial processing, to control color sequences, to add glitz or sparkle fiber into something that needs it.... in short, it's another way for spinners and felters to have great control over their fiber preparation. Here is an excellent YouTube video on using blending boards. Our blending boards are made of maple, cherry or other hardwoods harvested and milled here on the farm. The board measures 17.5 inches long overall by 12 inches wide, with the actual blending board cloth measuring 12 by 11.5 inches. The cloth, maufactured by Howard Brush Co., features 72 tpi (tips per inch) and is stapled securely on all edges and is suitable for all types of fiber. 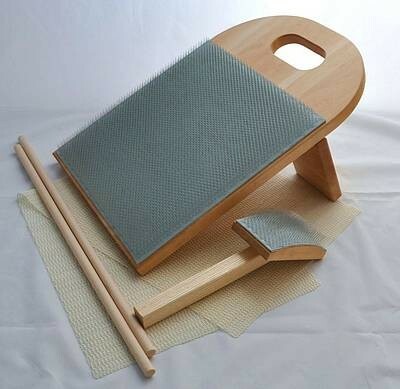 The board comes with a detachable keel which will swivel as needed, a sturdy brush of the same cloth for applying your fiber to the board, two polished dowels for fiber removal and a non-skid matt. Many people use the board on their lap with the keel between their knees but if you want to use it flat (or tilted wth the keel) on a table the matt will keep the board from scooting around. Our blending board and accessories come in their own clear plastic storage case which will protect your equipment when not in use and even have some room left to include a bag or two of fiber should you have to stop and set your current project aside. While we prefer natural materials plastic does have its uses and we were happy to find good quality containers manufactured here in the US. Do you need a board with finer cloth? We can do that! We now offer blending boards with 120 tpi carding cloth for use with very fine fiber. Same components, same price - $159 ! Just specify 'Fine' or 'Regular' when emailing. ** Please contact us to order. ** Given a zip code we can offer exact mailing and UPS options for you to choose from. Most orders should ship for around $20 but the cost may be somewhat higher due to your distance from us. Once the total is calculated we will send a PayPal invoice or wait for payment by check.